A jelly roll, also known as a swiss roll, is a large, thin rectangle of sponge cake that is spread with jam and rolled up. It is traditionally served with only a dusting of powdered sugar, but some variations – noteably the Yule Log – call for frosting the cake and many people perfer to top each slice with a dollop of whipped cream. The cakes have been fairly popular since the mid 1800s, but have recently seen a decline in popularity due to an increased preference for sweeter, more decadent cakes. I really like these relatively plain cakes, so it’s a shame that more people aren’t enjoying them. They are light, just sweet enough from the jam, and very attractive. They go wonderfully with tea. The recipe I used is from Paula Deen. 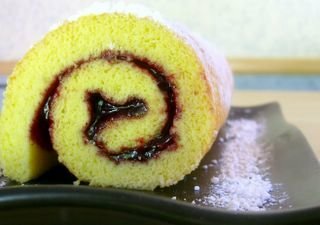 I have made chocolate and pumpkin rolls in the past, but Paula’s Old South Jelly Roll is actually the most reliable that I have come across and it certainly produced excellent results. The cake is light and even, with a nice crumb and a slight sweetness. I love the fact that Paula didn’t skimp on the vanilla, so the cake had a nice flavor and wasn’t eggy, which sometimes sponge cakes are. It was also very easy to handle, as the rolling is the most difficult part of preparing this cake. Once it is baked, the cake should be turned out onto a sugared dish towel and rolled up. The hot cake will roll smoothly and without cracking and the moisture that is trapped by the towel will keep it tender as it cools. The jam can be spread into the cooled cake before easily re-rolling it. Use any kind of jam. I used a mixed berry here, but you can never go wrong with strawberry or raspberry. It should be noted that the cake should be served the day it is made or, if you make it the day before, be sure to wrap it well. Since there is so little fat in the cake, it will dry out a bit if left out. Serve it with a generous dusting of powdered sugar if you’re a traditionalist, like me, or whipped cream and berries, if you prefer. Line a 15 by 10 by 1-inch jelly roll pan with parchment paper. In a large bowl, beat the egg yolks with an electric mixer until light. This will take a few mintues. Gradually add in the sugar, followed by the vanilla, and mix until fully combined. Sift the cake flour, baking powder and salt into the yolk mixture and beat in until just combined. Quickly clean and dry beaters well, then beat the egg whites to soft peaks in a medium bowl. Gently stir 1/2 of the egg whites into the flour mixture, then fold in the rest of the whites until the batter is even. Pour into prepared pan. Bake at 400F for 8 to 10 minutes, until the cake is golden and springs back when lightly touched. Dust a large dishtowel with powdered sugar. When cake comes out of the oven, loosen edges of cake, then place the sugared towel on top of the cake (yes, some will come off), then invert the pan so the cake comes out onto the towel (which should be lying on a table or counter). Trim off the firm edges. Beginning with the short side, roll cake and towel up together. Place towel wrapped cake on a wire rack and let cool. When cake is cool, gently unroll and spread with jam (or jelly) and re-roll. Place on a serving plate. Before serving, sprinkle with powdered sugar and/or top each slice with a dollop of whipped cream. Lovely! I think these are under-appreciated, too. My cousin Laura makes chocolate rolls filled w whipped cream for their Christmas dessert … as I recall, she even makes them ahead to freeze. I haven’t made it yet but it’s in our family cookbook if you’d like what at least would be a well-tested recipe. I never have any luck with the rolling part. It always cracks before I am done or when I unroll. Is there a trick or what? Yes, jelly rolls are great and elegant enough for the best dinner parties. I never rolled one right out of the oven, so a couple of times I had to bake another one because the first had dried out. We ate that one anyway. I put a few strawberries or raspberries with sugar in a blender, the resulting syrup I spread on the jelly roll, add a layer of whipped cream and depending on the berries, add them sliced or whole on top of that. I roll everything up, spread whipped cream on the outside and decorate with whole berries. It looks quite impressive especially when sliced and has been an all time favorite ever since I tried it out first. The recipe worked beautifully. This the first time ever that I rolled a jelly roll without some disaster. Thanks for the recipe. Hi! I LOVE this recipe, I just tried it for the first time and it actually inspired me to blog… anyway, I just wanted to let you know that I used your recipe for my first post pretty much verbatim, but I did cite you with quotation marks and link back to your website several times, in addition to making a few of my own modifications here and there (I made a lemon-lime cream roll instead of the jelly roll). Anyway, I hope you don’t mind but if you do just let me know! I’m a huge fan of all your recipes and I don’t want to do anything that would make you uncomfortable. Thanks again for another awesome dessert! Can I freeze the jelly roll after I’ve spread it with jelly? Can this recipe be converted to a kosher Passover recipe? Cindy – You can, however the cake might be a bit soggier after unfreezing, though it should still taste good. As far as converting it to a passover-friendly recipe, are you asking about removing the flour from the cake or the leavening? You will be able to make it without the leavening, but the structure of the cake will change if you omit or change the flour.